Okay here is my next installment of my Comic Book Casting. This time around I am reaching into the Image/Wildstorm vault for one of my favorite fun reads. I know a lot of people consider this book to be just another “Cheesecake” title, but when you really give it a chance it is a lot of fun and very well written. Danger Girl is the story of a small group of female secret agents who report to a former major spy for the british government. It is a cross between Indiana Jones and James Bond. There have been a good amount of mini-series to this book all of which are great reads. 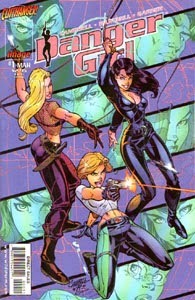 The series was created by Andy Hartnell and J. Scott Campbell. Campbell no longer does the interior art, but still does a lot of the covers for the series. However Hartnell has stayed on as writer for the whole series. It needs to be a good balance of humor and action so I would tend to favor someone like Edgar Wright. Between his Cornetto trilogy and Scott Pilgrim Wright has shown he has a real knack for balancing good humor and solid action. He even manages to work in some genuinely beautiful character moments that can really pull at the heart strings. Abbey is a slightly accident prone Lara Croft-esque relic hunter who is drafted into the Danger Girl organization to help track down a potentially extremely dangerous relic. I have my eyes set on Amber Heard for this one. She has an acting talent and I feel she could really fill out the part well. Sydney is an Australian operative who prefers the use of a whip and usually wears a leather jumpsuit. She is a veteran agent who has a serious issue with Johnny Barracuda. She is wild and uncontrolled, but gets the job done every time. My choice for Sydney would be Kate Beckinsale. She is a great actress when she really puts the work forth and can handle the physical side of the role as she showed in movies like Underworld and Total Recall. Plus she wouldn’t have to work hard to get the accent right. Valerie is the youngest of the team and the resident tech guru. She rarely leaves headquarters, but always dreams about being one of the field operatives. This role is perfect for Emma Stone in my eyes. Stone has a natural gift for the comic timing that is necessary for playing her. And I think she would work well with all the other cast members. A russian spy and veteran to the spy game Kassle is a strong member of the team. Natalia never really hits it off with Abbey for some reason. After lots of searching I think that Laura Vandervoort. Mainly because I think she has some serious potential and a role like this could get her the exposure she deserves and allow her to really shine. I first took notice of Vandervoort on Smallville where she played Kara-El/Supergirl. She showed the potential to be very good, but the CW writing never really gave her what I feel she could’ve used to really step out. However she still impressed me a little with her performances in the few seasons she was there. Deuce is unapologetically based on Sean Connery. In character and design. He is a former British Intelligence agent who now runs the Danger Girl operation. Deuce takes no crap from any of his agents and doesn’t hesitate to jump into the fight when necessary. Now I could take the easy road and just say lets get Sean Connery out of retirement for this part, but that would be too simple. I think it would be way more fun to cast either Timothy Dalton or Pierce Brosnan slightly aged up in this role. Both could play the part well, and that they are both former Bond’s could make for a little bit of added humor to the fact that Deuce is just supposed to be a old retired James Bond. An obvious reference to James Bond, Barracuda is a shallow womanizing secret agent who has an interesting relationship with Sydney Savage. He is always very concerned only with himself, but he makes for a lot of great humor. This part is tailor made for Bradley Cooper, he has the debonaire smile and quick humor. What makes him great for this part is everything that he showed in movies like The Hangover and his role as “Face” in the A-Team. And I really think he and Beckinsale would have some great chemistry playing off of each other as the tension between their characters builds. A Bane like character Maxim is roided out by a “Ubermensch” formula that gave him his size and strength. Maxim never shows his face and is pretty mysterious for the most part, but presents a valid threat to the Danger Girls. Maxim is the head of the villainous Hammer army which is the main antagonist in the original Danger Girl story. You could easily go with an actor like Dave Bautista on this because Maxim doesn’t talk a lot. His part as the Brass Body in Man With the Iron Fists showed how imposing he can be in a well written silent part. But you could also cast a really tall and burly actor, because he never shows his face. in the long run all that matters is that he is believable as a one man threat to anyone who crosses his path. That wraps up my next installment of my Comic Book Fan Castings. As always I appreciate comments on what you guys think of my casting decisions or suggestions on other books to have some fun and fan cast. Thank you for reading.